As many of our members know, our VetRewards Card is recognized at more than 100,000 locations across America, from AT&T or Verizon stores for wireless deals, major pharmacies, car rental counters, Ford Dealers or Greyhound Bus terminals, among others. These are direct partnerships, and you can find them in our Military Discounts Marketplace. But did you also know many other places outside of the Veterans Advantage program may also accept your VetRewards Card as a valid form of military ID? 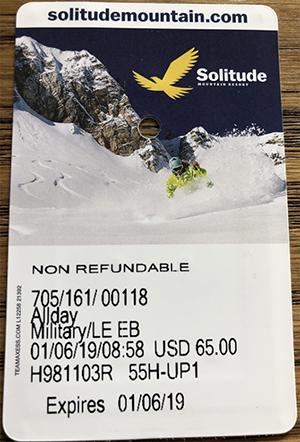 Traveling to Salt Lake, I got nearly 35% OFF my ski lift ticket at Solitude Mountain by presenting by VetRewards Card. I was thanked for my service, and presented with a $99 ticket for only $65! I put a picture of my lift ticket here to commemorate the occasion, and a photo from the mountain with (l. to r.) me, my son Parker, who is also our Digital Director, and his girlfriend, Beverly. Check locally, and wherever you travel. You’ll never know what savings you can unlock when you use your VetRewards Card!